WorldCat, an aggregate database of library catalogues worldwide, was primarily set up to aid libraries in carrying out their work in areas such as cataloguing or resource sharing. But the information it carries about much of the world’s accumulated published output is also a a unique source of information for answering a wide range of questions about world literature and other forms of creative expression. Brian Lavoie offers an insight into the types of questions WorldCat data can provide answers to, and how research of this kind also amplifies the value and impact of library collections. WorldCat is an aggregate database of library catalogues, encompassing the collections of many thousands of libraries worldwide. It contains more than 425 million bibliographic records, each describing a distinct publication, and more than 2.6 billion library holdings, each indicating a particular library holding a particular publication in their collection. The publications represented in WorldCat include materials of all descriptions – books, serials, maps, recordings, etc. – and from all time periods, from ancient times to the present. WorldCat is produced and maintained by OCLC, a non-profit global library cooperative that provides shared technology services, original research, and community programmes to libraries worldwide. A public interface to WorldCat is available online. WorldCat’s primary function is to aid libraries in carrying out their work in areas such as cataloguing or resource sharing. But it is also a treasure trove for research in the humanities and social sciences. WorldCat contains bibliographic information about much of the world’s accumulated published output – especially monographs – and is therefore a unique source of information for answering a wide swathe of questions about world literature and other forms of creative expression. The answers are derived from data that libraries create to describe the materials in their collections, which is then aggregated in WorldCat. Using this data, interesting discoveries can be made not by looking in a book, but by knowing information about the book. And not just one book, but potentially tens of millions of books and other materials! WorldCat provides us with the opportunity to engage in a “distant reading” of published materials. In a print-centric world, scholars were usually limited to “close reading”: studying the contents of individual books, articles, and other materials. With the advent of powerful computing resources and digitised information, new possibilities have arisen for computational analysis of mass aggregations of digitised texts. Led by scholars such as Franco Moretti (who coined the term), distant reading brings the tools of data-intensive analysis to the humanities and other disciplines. While distant reading usually refers to mass analysis of the contents of books and other publications, we can also think of it as mass analysis of information about a collection of materials. WorldCat is the largest aggregation of information about the world’s publications, and as such, it provides the opportunity for a distant reading of society’s collective creative output, or some subset of that output. Library data can also be used in conjunction with socio-economic frameworks. 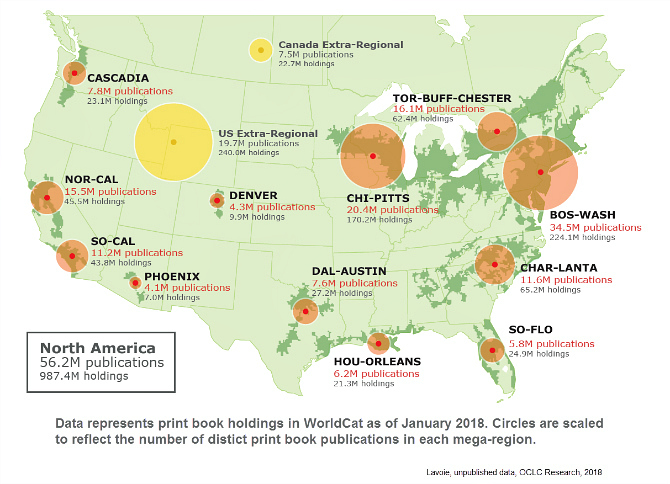 OCLC produced an analysis of the distribution of library collections based on “mega-regions” work led by urban studies scholar Richard Florida. A mega-region is a regional conglomeration of multiple urban centres and their hinterlands, connected through networks of infrastructure, economic interdependencies, and cultural ties. For example, the Boston-Washington corridor on the US east coast is one such mega-region. Using WorldCat bibliographic and holdings data, we determined the size and characteristics of the “collective collection” formed by aggregating all library holdings in each of the 12 US and Canadian mega-regions identified by Florida and his colleagues. While this data illuminates many issues of special interest to libraries, it can also be used to correlate regional library collecting activity with a wide range of economic and social metrics. Figure 1: the North American mega-regional collective print book collections. Figure 2: Most common language other than English and Spanish found in public library collections, by US state. These studies provide a flavour of the types of analyses that can be done with library data. A database of WorldCat’s proportions allows us to engage in new forms of “big data” analysis in literary and socio-economic research. WorldCat’s coverage and comprehensiveness, though not perfect, is sufficient to build a big picture view of world literature and other interesting aggregations of material, which can then be explored at scale through computational analysis. Please note this post was updated on 20 September 2018 to feature a corrected version of Figure 2. Brian Lavoie is a Senior Research Scientist with OCLC. His research interests include analysis of library data, patterns and trends in the evolving scholarly record, and organisational and economic aspects of libraries and library capacities. His ORCID iD is: 0000-0002-7173-8753. 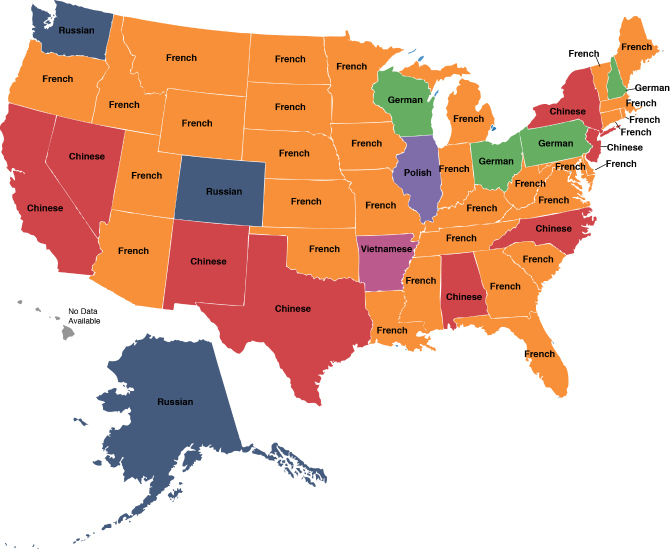 I think there’s an error in figure 2 where it says ‘Spanish’ for Connecticut. Thanks for spotting this! The coloration for Connecticut is correct, but the label is a typo: it should read French, not Spanish. A corrected version of the map will be posted soon.